This evening, an unprecedented level of participation from new markets propelled Sotheby’s London Evening Sale of Old Master & British Paintings to £35,048,000. Collectors from 33 countries took part in the sale with record numbers from Asia and the Middle East. More than 400 years since El Greco executed Saint Dominic in Prayer in fifteenth century Toledo, bidders from new markets battled tenaciously for this this powerfully expressive work which was appearing at auction for the first time. They drove the price to £9,154,500 (est. 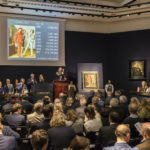 £3-5million), a new record for a Spanish Old Master and the highest price across London’s Old Masters sales this week. In total, 8 auction records tumbled tonight, including that for Claude-Joseph Vernet, whose outstanding View of Avignon from the right bank of the Rhône outstripped pre-sale expectations to realise £5,346,500 (est. £3-5million). A new auction record for a female Old Master artist was also established when Rachel Ruysch’s Still Life of roses from 1710 achieved £1,650,000 (est. £1-1.5million). What's Up with Impressionist and Modern Art?